BARE’s healing regimen of Shea Butter and natural ingredients address ingrown hairs, razor bumps, razor burn and dark spots while providing a rich and luxuriously close shaving experience. Eucalyptus essential oil is said to have an expansive effect that can be both calming and invigorating and feels cool to the skin. Eucalyptus essential oil is said to have an expansive effect that can be both calming and invigorating and feels cool to the skin and warm to the muscles. Pine essential oil has a distinctive essence and gives a sweet aroma to the cosmetics it is used in. Pine plant oil is widely used as massage oil and in perfumes and other scents. The health benefits of pine oil include some emotional benefits. It gives an energizing, invigorating feeling. Pine plant oil is also useful for people suffering from loss of concentration and loss of memory. Regular massage with pine essential oil lends mental clarity. How To Use: Lather up a dab of shave cream with your fingers. Apply lather on the face and shave with the grain. For a closer shave, re-lather and shave lightly across or against the grain. Apply BARE"DASHING" or "DARING" After Shave! Water, Emulsifying Wax NF, Organic Aloe Leaf Juice, Kosher Vegetable Glycerin, Sunflower Seed Oil, Cetyl Alcohol, Organic Jojoba, Emu Oil, Shea Butter, Green Tea Leaf Extract, Allantoin, Vitamin C Ester, Panthenol, Vitamin E, Organic Black Willow Bark Extract, Pine, and Eucalyptus Essential Oil, Germall Plus. Just so the guys don't feel left out, Martha made a line for men too! (Guys, say Thank You.) 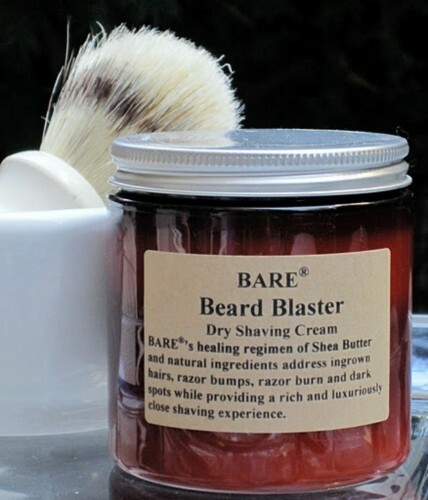 Hubs loves this Pine Cedar Beard Blaster, a shaving cream made with beeswax. The beeswax almost acts as a protective barrier, which gives a close shave with virtually no effort at all. But the part I like is that he doesn't need to pile on the aftershave when he uses this.